A boiler is a heating system component designed to heat water for distribution to various building spaces. As water cannot be used to directly heat a space, boilers are only used in central systems where hot water is circulated to delivery devices (such as baseboard radiators, unit heaters, convectors, or air-handling units). Boilers are commonly designed to utilize two of the four basic heat sources: onsite combustion (coal, oil, natural gas, propane) and electric resistance. Natural draft v/s forced draft. Fire in tube v/s water in tube. In this type of boiler, the combustion air is drawn in by natural convection and therefore there is little control over the air/fuel ratio. In this type of boiler, the quantities of combustion air and air/fuel mixture are controlled by a blower. It is used in Smaller commercial buildings where water is heated to appropriate distribution temperatures (typically 140 - 180°F). These systems are often "closed" with virtually no fresh water makeup. Hot water boilers are often preferred because they normally do not need an operator or special water chemistry, and they run at higher fuel conversion efficiencies than steam boilers. These boilers are found in many different configurations, but all serve one purpose: to contain water and transform it into steam by the application of heat. In fire tube boilers, hot combustion gases pass through tubes submerged in water. Fire tube boilers are prone to fouling. In water-tube boilers, the water is contained in tubes located inside a furnace and hot flue gases pass over the tubes, heating the water, and then exit out the stack. A condensing boiler preserves energy by using heat exchangers designed to remove additional energy from the gases of combustion before leaving the stack. The flue gases produced from condensing boilers are at a much lower temperatures than those of non condensing boilers to the extent that the water vapor in the flue gases condenses, thus releasing their latent heat and increasing efficiency of the boiler. These boilers are not available in larger sizes. To accommodate larger heating loads, multiple condensing boilers can be installed. One advantage of a heat pump is that it provides both heating and cooling capabilities in one unit. Electric heat pumps are usually supplemented with a backup system, such as radiant floor heaters or baseboard units, in case of extended periods of extreme low ambient temperatures. 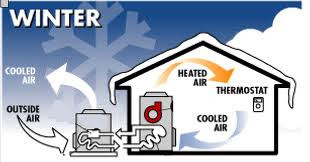 It Uses air as the outdoor source of heating or cooling and delivers heating or cooling to air indoors. A condenser absorbs heat from the outdoor air (even the coldest air contains some heat) and transfers it to an indoor heat exchanger. Indoor air is warmed in the heat exchanger and circulated throughout the interior space. During the summer, the process is reversed to cool and dehumidify the home. It Uses water as the source of heating/cooling, delivers heating /cooling to air indoors. 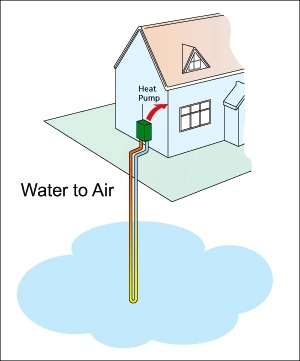 Instead of extracting heat from outside air, this type of pump absorbs heat from ground water or surface water, such as a farm pond. 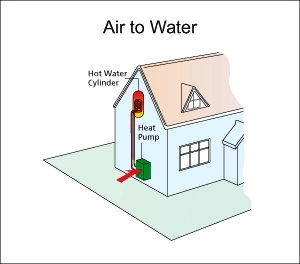 It uses air outside, water inside: useful where there is a demand for hot water as well as for air cooling and dehumidification). 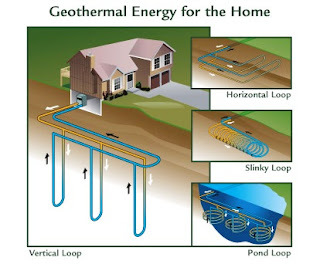 Also known as a geothermal system, this type of heat pump uses underground loops to absorb heat from the earth. Geothermal systems are usually installed in newly-built homes, but can also be used in existing home. Under floor heating is a form of central heating and cooling which achieves indoor climate control for thermal comfort using conduction, radiation and convection. Modern under floor heating systems use either electrical resistance elements ("electric systems") or fluid flowing in pipes ("hydronic systems”) to heat the floor. Either type can be installed as the primary, whole-building heating system or as localized floor heating for thermal comfort. Electrical resistance can only be used for heating so when space cooling is also required, hydronic systems are used. Electric heating elements or hydronic piping can be cast in a concrete floor slab ("poured floor system" or "wet system" or “In floor system” see fig.1). They can also be placed under the floor covering ("dry system" or “Under floor system” see fig.2) or attached directly to a wood sub floor ("sub floor system" or "dry system"). Local systems tend to be distributed systems; a building conditioned using local system may have a dozen (or a hundred) individual and independent units located throughout the building. Distributed systems tend to provide greater collective reliability than do centralized systems. The failure of one of 12 heating units, for example, may cause discomfort in one room of a building but there are still 11 operating units that can provide heat for the rest of the building. Because local systems are likely to be of small capacity and are not complicated by interconnections with other units, maintenance of local systems tends to be simple and available through numerous service providers. In a building where a large number of spaces may be used only on an occasional basis, such as a dormitory or hotel, local systems may be totally shut off in the unused spaces, thus providing potential energy savings. A local HVAC system may provide greater occupant comfort through totally individualized control options -- if one room needs heating while an adjacent one needs cooling, two local systems can respond without conflict. Local system units cannot be easily connected together to permit centralized energy management operations. Local systems can usually be centrally controlled with respect to on-off functions through electric circuit control, but more sophisticated central control (such as night-setback or economizer operation) is not possible. Local systems can not benefit from economies of scale. The efficiency of equipment generally increases with capacity; as each local unit is normally of low capacity; local system efficiency is relatively low. Lack of interconnection between units also means that loads cannot be shared on a building-wide basis. Several central HVAC systems deliver improved efficiency and lower first cost by sharing load capacity across an entire building. Although local system maintenance may often be relatively simple, such maintenance may have to occur directly in occupied building spaces. In the next Topic, I will explain the Cooling systems (Air Conditioning systems) types, classifications and equipment. So, please keep following.